Hi. It’s been a while. Let’s get caught up, shall we? By a narrow margin, we have decided that Ohio State plays in the Pork Division. Excellent decision, you guys. Boy, the Nebraska game was fun. I didn’t feel like there were huge defensive lapses — in spite of Nebraska’s 38 points — and the offense … hooboy, the offense. The weather was gorgeous, the halftime show — that was the video game theme show, the one that went viral in the days that followed the game — and with the exception of Mrs. Crappy’s absence for illness, that was a great time all the way around. Boy, the Nebraska tailgate was, uh, even funner. We had a huge crowd for the all-day party, and we had two excellent meals. Suzanne was the star of the lunchtime show; her Mexican tarts — known to Juan as “our special guests” — were delicious, and the corn I made to go alongside turned out pretty well, if I do say so myself. For dinner, we went through about 18 pounds of the family sloppy joe mix. Everyone went above and beyond the call of duty in bringing along snacks and sides, and our other special guests — all part of Lovely Rita Meter Maid’s entourage — were awesome people to hang out with all afternoon. We got home from the night game and finished unpacking around 2 a.m. Sunday. I love night games, but I’m glad they happen just once a year. Recipes? We have recipes. Specifically, the recipes for Suzanne’s tarts and my corn will be coming soon. Bud and Pat visited Pittsburgh for my birthday weekend, which meant we watched the Indiana game at home, accompanied by pizza from our favorite local place. 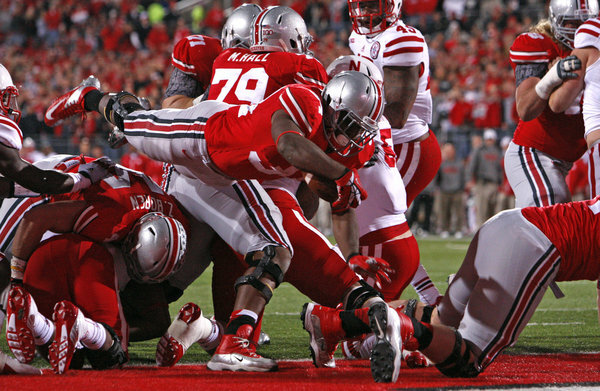 That part was good; Ohio State’s defense was not. But I knew that might be the case when I saw a tweet from Tim May, who saw that Zach Boren was warming up with the linebackers. My folks went to bed with about five minutes left in the game, and joked about me coming to get them if Indiana came back. And they didn’t believe me when I told them the final score on Sunday morning. If you’re ever looking for pizza on Pittsburgh’s North Side, look up Pizza Pescara. Seriously. And now we’re in Columbus, watching the weather and eyeing an early bedtime, so we can be ready to do it all over again in the morning. It’s a little difficult to believe that there are just three more home games this season, but there you go … Purdue, Illinois and our bowl game for the season against the Team Up North. That’ll make for a good finish, boys and girls, even without postseason play — and it’s time to get ready for the 2012 Pork Division Championship. The Ohio State-Nebraska game and the atmosphere around it was what college football is all about :).